I’m going to ramble a bit today but it will all come together in the end, I promise. I’ll start with a story from a tournament I played in a number of years ago. I’m going to change the name of the other party in question (I’ll call him “Bill”) because it’s not my intent to embarrass anybody here; I’m just telling a story. Everybody who plays tournament chess for any length of time winds up with a pile of “weird tournament tales” to swap at the watering hole with other players, and this is one of my weirdest. I was playing in a small weekend event which was run by a local master-level player (who, as stated, I will call “Bill”). Bill was something of a legend for a whole lot of reasons, not the least of which was his sheer size; calling this guy “obese” would be an understatement. “See what?” Bill replied (in a somewhat surly manner). Believe it or not, there is a connection (at least an oblique one) between that story and the subject of today’s post. It’s a fact that masters and grandmasters play better chess than the rest of us, but it’s also a fact their chess isn’t perfect; masters and GMs do make mistakes. According to a grandmaster of my acquaintance, those mistakes tend to fall into common identifiable patterns; furthermore, we mere mortals who play chess down here in the fish pond, struggling to improve our chess play, can learn to not make those same errors. That’s the basic thesis behind a new series of ChessBase FritzTrainer videos by GM Maurice Ashley. The series is called What Grandmasters Don’t See, and the first volume “Protected Squares” is a real barnburner of a training DVD. Now I will freely admit to a bit of bias here. I’ve been acquainted with GM Ashley for more than a decade (we’ve conversed on the phone and corresponded a fair little bit), and have been a fan of his for even longer. I’ve frequently mentioned elsewhere that I was an avid viewer of his chess TV shows on ESPN back in the mid-1990’s, and his beginners’ chess software program from the late 1990’s was a big hit with my sons back when they were in elementary school and trying to do well at chess club meetings. Maurice (and I hope he considers us to be well enough acquainted that I can use his first name) is a really engaging speaker and has always endeavored to make his video presentations entertaining as well as informative. In my opinion, he hit it out of the park with What Grandmasters Don’t See: Protected Squares, and I’ll tell you why in a moment. First we’ll get the technical stuff out of the way. 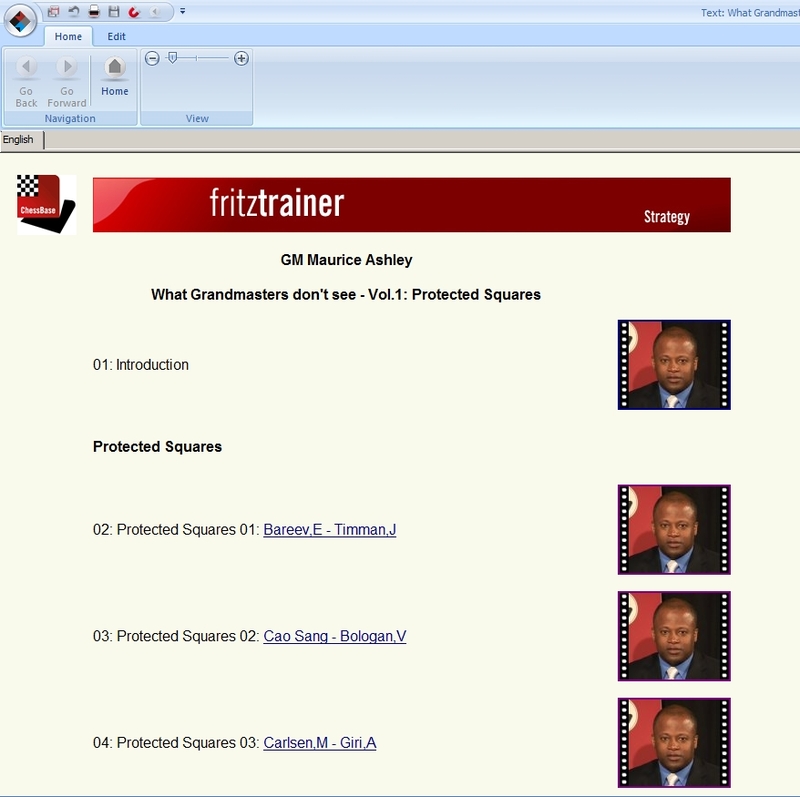 As I’ve previously blogged, FritzTrainer DVDs come with a free “reader” version of ChessBase, so you don’t need any other program to view them. However, if you already have Fritz (or one of the other ChessBase playing programs), ChessBase 10, or ChessBase 11, you don’t need to use the “reader” software – just use what you already have (and the two links in this paragraph will take you to the instructions if you don’t know how to do it). So just what the heck is What Grandmasters Don’t See: Protected Squares all about anyway? Here’s another story (I told you I was going to ramble today). I’ve recently been editing an old early twentieth century chess classic (in Descriptive Notation – ugh!) for electronic publication and I sometimes find myself confused when I’m inputting a variation line using ChessBase. That old-style notation is sometimes unclear as to which piece is going where: “N-N6” isn’t terribly helpful when two White Knights can move similarly, one to b6 and one to g6. I’ve had a couple of recent cases where one Knight can move to an undefended square while the other can move to a square guarded by a Black pawn. I naturally (and automatically) move the Knight that can go to the undefended square, and a few moves later discover that it was the other Knight which should have moved. “Wait a minute…why doesn’t Black just cop off the Knight with the pawn?” I say, and then stare intently at the board for several minutes until I finally spot the three-mover that occurs upon the Knight’s removal. Then, feeling like a real horse’s patoot, I have to take back a bunch of moves and input the correct Knight move before I can proceed with the rest of my editing. Face it – we’re all trained from the very start of our chess careers to NOT put pieces on squares defended by pawns, so much so that we don’t even consider such moves anymore. And we miss some really sweet combinations as a result. There’s no need to feel badly about it – even grandmasters miss these moves. And that’s the whole point of What Grandmasters Don’t See: Protected Squares: GMs miss these moves all the time, too. But (and this is the cool part), GM Ashley contends that we can untrain ourselves, reject the idea that pieces can never go to pawn-defended squares, and spot some great combinations for ourselves – even regular folks like you and I, who put our pants on one leg at a time, can do it. Now I’ll tell you straight up that I’m blown away by What Grandmasters Don’t See: Protected Squares; first, the fact that Maurice even spotted this deficiency (as he says on the disk “grandmasters miss moves on squares that are protected by pawns, and these kinds of squares are important for us to pay attention to”) as one which is common to grandmasters is pretty impressive to begin with. Second, the fact that he sees this as applicable to “regular” players and, furthermore, as correctable is pretty big news for struggling players such as you and I. Third, the fact that he makes the lessons entertaining as well as instructional is dang near miraculous. 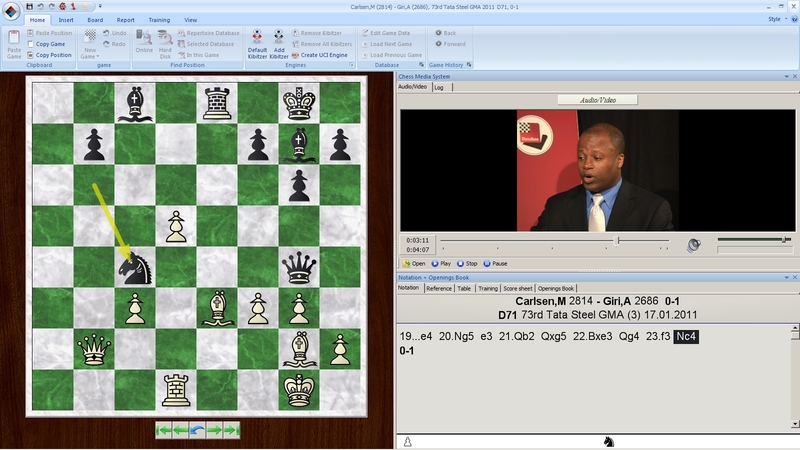 The videos typically weigh in at under ten minutes each (perfect for aging patzers with short attention spans, like myself), and the games he’s selected are themselves pretty entertaining; even if you (for whatever reason) find yourself unable to correct this flaw in your own play, you’ll still have a lot of fun viewing these games and listening to GM Ashley’s lively and compelling commentary. I think the cardinal sin of many, many chess videos is that they’re boring, but that’s definitely not a criticism that can be leveled at this DVD; if you’re not having a good time watching these games, it’s likely because you’ve stopped breathing. 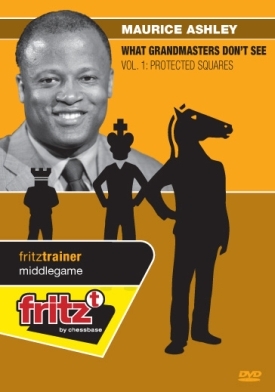 As I said, Maurice Ashley hit it clean out of the park with What Grandmasters Don’t See: Protected Squares, and I heartily recommend this DVD to any player who wants to be educated and entertained at the same time.